The conference formally known as the Big 10 seemingly had one of the worst weekends it could imagine, with most of its football teams either losing on the national stage or struggling against in contests versus perceived lower level opponents. So how bad was the B1G’s day? To start, the 13 teams playing (Indiana was off) finished 2-11 against the Las Vegas point spread, with several teams falling well short of the game’s closing number. Here’s a dot-chart of how each team did, relative to game point spreads. 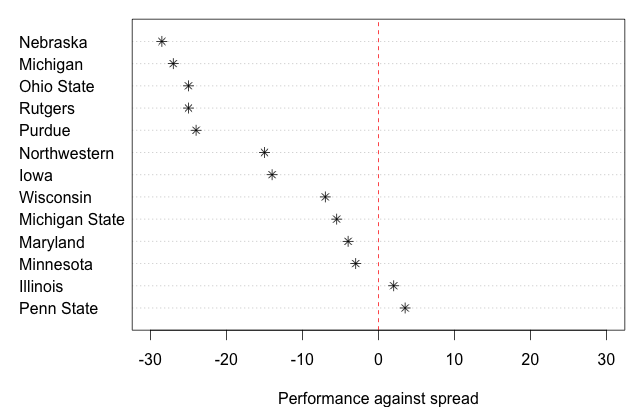 For example, Nebraska, which was favored by 35.5 points over McNeese State but only won by 7, had the conference’s worst day relative to the point spread expectation (-28.5).